New order for engines to power ten new aircraft announced on November 12. Vietjet Air and Pratt & Whitney, a world leader in the design, manufacture, and service of aircraft engines and auxiliary power units, announced on November 12 the selection of PurePower Geared Turbofan (GTF) engines to power the carrier’s order of ten new aircraft. The announcement was made on the occasion of APEC 2017 and the first official State visit to Vietnam by US President Donald Trump. Valued at $600 million at list prices, the deal includes a 12-year EngineWise™ Fleet Management Program for Vietjet’s ten new-age aircraft. The two companies have so far reached deals worth $3.7 billion. Since entering into service in early 2016, the GTF engine has demonstrated its promised ability to reduce fuel burn by 16 per cent, regulated emissions by 50 per cent, and noise footprint by 75 per cent. 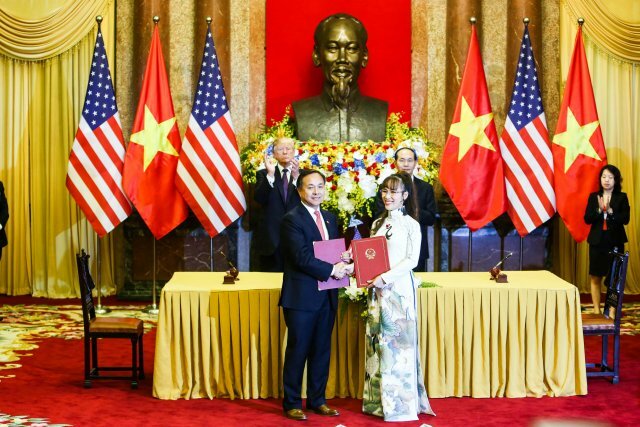 “We were honored to celebrate a new relationship with Vietjet last year, and we are thrilled to extend this relationship now and into the future,” said Mr. Rick Deurloo, Senior Vice President of Sales, Marketing and Customer Support at Pratt & Whitney. Since commencing operations in 2011, Vietjet Air, Vietnam’s largest domestic airline, has become Asia Pacific’s fastest growing low-cost carrier. It has operated profitably since its second year of operations with over 73 domestic and international routes and a technical reliability rate of 99.6 per cent; the highest rate among airlines in the region operating the same aircraft.